Camp Kintail warmly invites the women of the church to a special event! In recognition of the long-standing support of the women of the church, Camp Kintail would like to say thank you by hosting a celebration at the camp. Through the Ladies Camp, sponsorship of campers, collections of donations, financial support, and constant prayers, the WMS and other women’s groups have been true champions of Camp Kintail and the ministry we provide. Everyone is welcome to come for lunch, crafts, campfire, tours, and worship in our outdoor chapel. There will be walking tours and an opportunity to meet the staff and try out some activities, indoors or outside. And of course, there will be cake. Come and experience the Christian community at Kintail again, and let our staff show you what they can do! In April of this year, the Rev. Marian Raynard returned to the Synod of Southwestern Ontario to begin her ministry with the rural charge of Rockway and First, North Pelham Presbyterian Churches in the Presbytery of Niagara. Marian grew up on a farm outside of Lucknow. She began to discern God’s calling while working at Camp Kintail in the early 1980s. Following Kintail, she graduated from Centralia College of Agricultural Technology and began working with the Wingham and District Community Living Association in Residential services. She was active in her community as a leader with Girl Guides of Canada, served on the Camp Kintail Board (1984 – 1991), Synod PYPS, and active in her home congregation of Lucknow Presbyterian Church. Through connections made at Kintail she had the opportunity to work with the Iona Community on the Isle of Iona in Scotland for a three-year contract in the early 1990s. This experience continued to encourage her to answer and explore God’s calling. While studying at Knox College, she worked as a student with the Ashfield and Knox, Ripley pastoral charge. 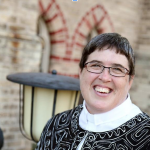 She was ordained in 2012 at the Lucknow Presbyterian Church having accepted a call to the rural pastoral charge of Sand Hill and St. John’s (Pittsburgh), in the Presbytery of Kingston, Synod of Central North Eastern Ontario & Bermuda. Marian enjoys a variety of music, taking her camera with her while out exploring, spending time with family and friends. One of her greatest joys is seeing how the Good News reveals itself through the story of our lives. She delights in listening to a person share their story – their joys and sorrows and how it inspires their faith and how they share their witness of justice and peace in the world.